Start your journey in the morning with a hotel pick-up from Chiang Mai city center. Take the 1-hour ride to the countryside of Mae Tang district. Get changed into the local clothes and be ready for fun activities. The experienced guide will provide information about the elephants' behavior and how to provide proper care for them. Then, you will get to prepare food and healthy treats for the elephants and feed them afterward. After that, you and the elephants will walk to play in the mud and sand spa. During this time, you will have a chance to observe their behavior. You can also enjoy the beautiful scenery as well. After your time with the elephants, change your clothes, shower and then enjoy a delicious traditional Thai buffet lunch, which is suitable for vegetarians. Next drive to ATV camp for doing a ATV activity. To end your trip, you will take the 1-hour journey back to the city and will be transferred back to your hotel in Chiang Mai city center. Pick up time at 07.00 am. - 07.30 am. Start your journey in the morning with a hotel pick-up from Chiang Mai city center. Take the 1-hour ride to the countryside of Mae Tang district. 8.30 am. Get changed into the local clothes and be ready for fun activities. The experienced guide will provide information about the elephants' behavior, elephant history, and how to provide proper care for them. 9.00 am. Then, you will get to prepare food and healthy treats for the elephants and feed them afterward. 11.00 am. After that, you and the elephants will walk to play in the mud and sand spa. During this time, you will have a chance to observe their behavior. You can also enjoy with the elephant for cleaning elephant's skin and scrub mud to their body for protecting elephant's skin from the insect, this activity depends on an elephant if elephant wants to do you can join. After your time with the elephants, change your clothes, shower. 12.00 am. Enjoy a delicious traditional Thai buffet lunch, which is suitable for vegetarians. 13.00 pm. After finished the elephant care program. 13.30 pm. The guide will give the information at the Peak Camp. 13.45 pm. Enjoy with ATV, Explore the mountain and panoramic view at Maetang area lead by our expert guides. Photographers—Bring your camera! This is a unique Off-road experience. Fun for the whole family—beginners, experts, and new driver. Are all welcome. 14.45 pm. Arrive at the rafting program, The guide will give the information. 15.00 pm. 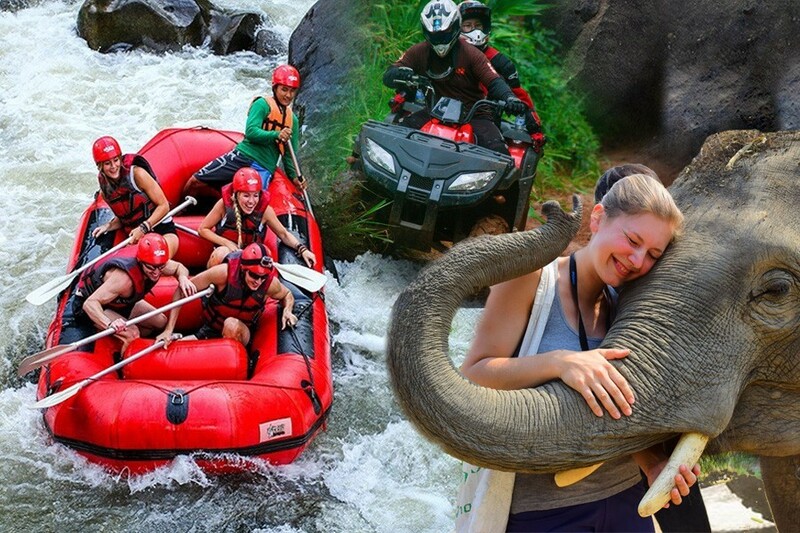 Enjoy with rafting Maetang river runs north of Chiangmai and offers the full spectrum of emotion. The Journey begins at the narrow point of the river with level 4 & 5 white-Knocked, Wide-eyes, Tumultuous rapids. This river and its canyon offer a truly adrenaline pumping rush down the rapids. Our safety staff are from the villages and are intimate with its character. They are all trained in safety & rescue procedure from both raft and shore. Our team is with you both on and offshore, as the river parallels the road. In our 12 years in business we have been without a safety incident. This is not a luck, but a passionate commitment to our safety philosophy. Your responsibility is to have as much fun, excitement & adrenaline rush as possible. Our responsibility is assuring you return next year for more.! - Food for elephant - bananas, and cane for the elephants. 1. All transactions must be settled day before guest program date (eg: heavy rain, sickness etc). 3. If you would like to change the date, please inform us with in 1 week.